Without a home of its own from 1790 until 1935, members of the Supreme Court wished for a permanent building in the nation’s capital city. Former President and newly-appointed Chief Justice William Howard Taft finally made those dreams a reality for the third branch of government. In 1929 the chosen architect, Cass Gilbert, submitted sketches, plans and a large plaster model of his design for the highest court in the land.., The plaster model was sculpted by John Donnelly, Jr. who also designed the Cast bronze entrance doors of the building. The model was exhibited in the US Capital building for several months before construction began. The Supreme Court original plaster model is now on exhibit in the ground floor. Architect Cass Gilbert, a pioneer in building skyscrapers, found inspiration from ancient Rome when he designed the U.S. Supreme Court Building. The Neoclassical style was chosen to reflect democratic ideals. Its sculpted pediments tell allegories of justice and mercy. Vermont marble was used for the exterior, while the four inner courtyards are of crystalline flaked, white Georgia marble. The last project of Gilbert's career, Supreme Court Building became a team effort by members of his firm. Sadly, Gilbert died in 1934…one year before the Building was completed. 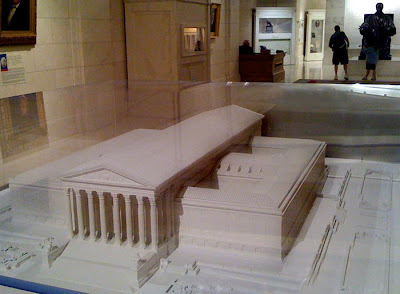 I’ll post more soon about the Supreme Court’s gift shop and other replicas on display.